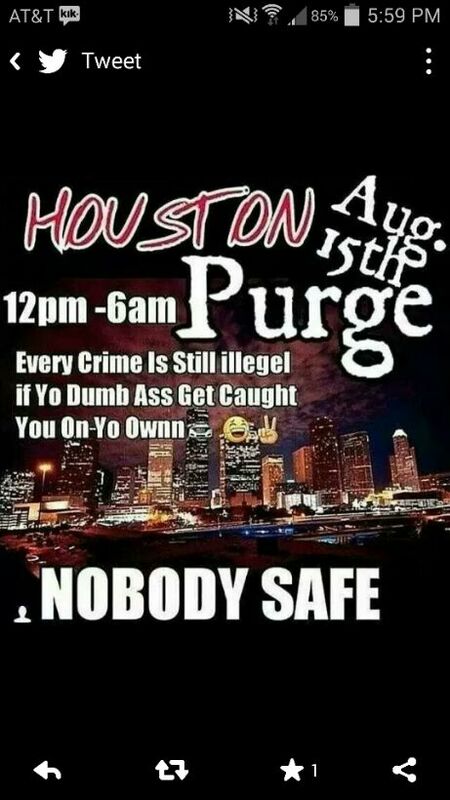 HOUSTON, TX - It’s a copycat scenario from the 2013 film “The Purge” where, sometime in the future, the government makes all crime legal for a 12-hour period. Authorities in Louisville cancelled local events and arrested the kid behind their hoax, who said he meant no harm. Charges are pending. Houston’s quasi-purge photo came and went with no big uproar. This photo was posted in the Houston subreddit on the 15th of August. Maybe it was the mention that every crime was still, what we think was supposed to be “illegal”, but this hoax didn’t catch any fire. It may have meant to be funny, but authorities aren’t laughing. An HPD spokesperson said if anything like this were to arise in Houston, those involved would be arrested and charged appropriately. With images like what we see in Ferguson, Missouri, where crimes are being committed every night, and police struggle to control the situation, this kind of humor is not appreciated.